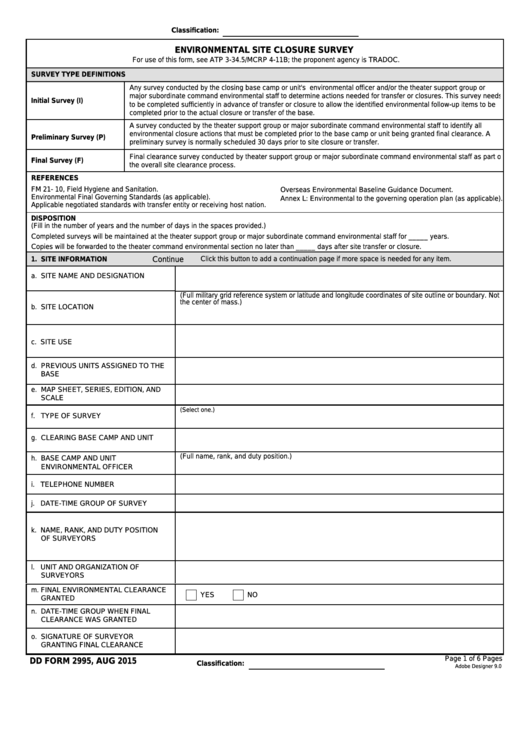 Download a blank fillable Dd Form 2995 - Environmental Site Closure Survey in PDF format just by clicking the "DOWNLOAD PDF" button. Complete Dd Form 2995 - Environmental Site Closure Survey with your personal data - all interactive fields are highlighted in places where you should type, access drop-down lists or select multiple-choice options. completed prior to the actual closure or transfer of the base. preliminary survey is normally scheduled 30 days prior to site closure or transfer. the overall site clearance process. FM 21- 10, Field Hygiene and Sanitation. Overseas Environmental Baseline Guidance Document. Environmental Final Governing Standards (as applicable). Annex L: Environmental to the governing operation plan (as applicable). Applicable negotiated standards with transfer entity or receiving host nation. Completed surveys will be maintained at the theater support group or major subordinate command environmental staff for _____ years. Copies will be forwarded to the theater command environmental section no later than _____ days after site transfer or closure.